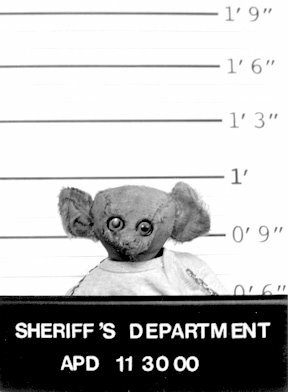 * That Winkie receive a fair trial, and that all charges for crimes committed before 1924 be dropped, since this was before the bear was made. * That those citizens who have screamed their wish to kill the bear themselves (with “bare hands” or other means such as hammers and chainsaws), be excluded from the jury. * That the judge practice objectivity, perhaps by listening to the wind in very tall trees. * That Winkie be served berries in jail. * That the Vice President cease calling for Winkie to be burned at the stake and tossed into a body of water to see if s/he floats, at least until the trial has begun. vigorous prosecution of this case sends a strong message to terrorists and potential terrorists: watch out. the best gauge that the strategy is working is that innocent people, too, are afraid of prosecution. when we all fear the law, we all benefit. p.s. the only objective juror is the one who proclaims winkie's guilt, loudly and often. careful that those who circulate or sign this petition don't find themselves surrounded by the angry flames of righteousness! One can obtain objectivity by listening to very short, trees, too. 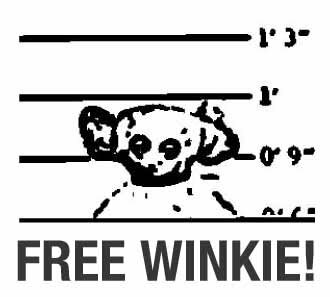 I urge the Free Winkie Committee--especially a certain member with a bewitching scowl--not to risk their safety by circulating this petition! May I adopt Winkie? He will join Andrew, Max, Lukkie, Scotty, and many others who watch tv every day and take nice naps under soft blankets. we really invaded Iraq because they had Winkies of Mass Destruction!